Almost 149 years have passed since John Wilkes Booth assassinated President Abraham Lincoln. Today, a different but related Lincoln faces a similar fate. It was April 14th, 1865. Our nation's horrific and only Civil War between the Confederacy to the South and Union forces to the North was mere days away from finally reaching its terminus. The night had barely lapsed into its adolescence when, amongst a crowd of over 1,000 people, a stage actor and Confederate sympathizer named John Wilkes Booth fatally shot and assassinated the 16th President of the United States and the man responsible for leading the Union to victory, Abraham Lincoln, with a single-round Derringer pistol at Ford's Theatre in the nation's capital. Tomorrow marks the 149th anniversary of President Lincoln's assassination. And while almost a century and a half's worth of sand has vanished from the hourglass since that fateful Spring night, Lincoln is still revered as an American icon and hero today; his legacy still lives on. Although it came at an extremely high cost, Lincoln's successful agenda to abolish slavery in the US brought our nation out of a dark period in its history and arguably laid the framework for the Civil Rights Movement that would transpire some ten decades later. Clearly, if it wasn't for Abraham Lincoln, the social and political landscape we know today wouldn't exist. And through the years, because of his remarkable achievement, monuments have been constructed in his honor. His likeness has been minted on US currency and even carved into the side of a mountain. He's been the subject of countless books, feature films and cartoons. His name can be even found on a car. When former Cadillac boss Henry Leland founded the Lincoln Motor Company in 1917, he named the firm in the honor of the 16th President whom he had first voted for in 1864. Initially building aircraft engines for the first World War, the Dearborn based company would soon break into the realm of luxury cars when the war ended. Sadly, Leland and Lincoln's first batch of cars weren't well received and the firm only lasted for only six years before it was forced into bankruptcy and subsequently purchased by the Ford Motor Company for the equivalent of $109 million dollars. Under Ford's ownership though, Lincoln flourished for almost 50 years. Some of its greatest cars were introduced during this time and they include the Zephyr of the '30s and the handcrafted 1956 Continental Mark II, which unbelievably put Lincoln in the same realm as Rolls Royce. In 1961, Lincoln revealed what is now known as its pièce de résistanc: the infamous fourth-generation Continental that would, unfortunately and in a fit of terrible irony, serve as the Presidential limo in which the 35th President of the US, John F. Kennedy, would be assassinated in. Its tragic political connections aside, the fourth-generation Continental with its rear-hinged suicide doors, chrome-trimmed slab sides and electric shaver grille was truly one of Lincoln's greatest masterpieces. It had charisma, it had presence, it had class. While competitor Cadillac was building massive finned tyrannosaurs festooned with vulgarity and wholesale amounts of chrome, Lincoln had built something leaner and a little bit cleaner. The '61 Continental was the anti-Cadillac and still managed to be just as successful as one, if not more: Continental sales for 1961 were almost double that of Cadillac's Sixty Special that year. And here's where we cut today's history lesson short. As I'm sure you well know, when the '70s usurped the '60s, Lincoln's reputation as a luxury brand went with them thanks in part to an oil crisis, import automakers and badge engineering. For over 40 years now, Lincoln has continuously floundered, building some of the most irrelevant cars on sale today. I only have to mention the name "Town Car" or "MKS" for you to get what I'm on about here. Four years ago, Ford finally became aware of Lincoln's problems (unbelievable it took that long, I know). In 2010, seeing that Lincoln sales were absolutely through the floor and desperate to reverse course, they hired former Cadillac designer Max Wolff to come in and establish a new look for the brand, appointing him as the brand's design chief. In 2011, Ford pledged that it was going to the extra mile and spend a billion dollars of its own money to restore Lincoln to its former glory. They believed that good design and good money would help fix Lincoln's problems. After all, it worked for Cadillac so why wouldn't it work for Lincoln? They've even been realistic and have said as recent as last year the process would take a decade to complete. I have my doubts. Personally, I think the Ford Motor Company has a would-be assassin lurking in its theater with the Lincoln brand set dead in his sights. Conspiracy? Who knows. What I think, however, is that this is going to amount to one hell of a dog and pony show when it's all said and done. The first of Mr. Wolff's efforts as design chief, the 2013 Lincoln MKZ, went on sale in January of last year. While it hasn't been a runaway success by any means, the MKZ is a nice looking car and is doing fair for Lincoln, even managing to help the brand regain lost ground. So you'd think Ford would be adamant about keeping Wolff around for a little while longer, right? To see what he could do next? Wrong. In fact, Ford silently canned Wolff back in December and put a 15 year company veteran in his place, a man named David Woodhouse. That move is part of a bigger picture, and a concerning one at that. Ford CEO Alan Mulally supposedly wants Lincoln to grab a bigger slice of the luxury car pie, that's why Ford is dumping money into the effort of revitalizing Lincoln. But, according to a recent Bloomberg piece concerning Ford's replacement of Wolff, Mulally wants to accomplish that without violating the "One Ford" plan that requires models, sold both here in the States and abroad, to share parts, platforms and other major items to cut costs. That's why the MKZ has a major Achilles heel that is preventing it from being a real success: peel away the sweeping bustle-backed bodywork and you'll find its absolutely no different or any more luxurious than a new Ford Fusion in Platinum trim. There is no substance to back up its style, nothing that justifies the MKZ's greater asking price. While you might think it was Max Wolff that failed the MKZ, it was actually Ford. According to the article, Wolff was trying to push for greater differentiation between Ford and Lincoln products, something Lincoln desperately needs other than good styling. Such an idea, however, would be in violation of Mr. Mulally's business plan. It was probably why Ford let Wolff go. And here we find Lincoln Motor Company's would-be assassin: it's none other than Mr. Alan Mulally himself. Sending Wolff — who was an outsider that refused to fall in line with the FoMoCo way of doing business and chose to stand up for what Lincoln really needed — packing and replacing him with a company man means that no one will be around to question Mulally's ridiculous goal for the brand that will ultimately be its downfall. It means future Lincolns will still be badge-engineered Fords. It means Lincoln will fail, Ford will waste a billion dollars of its own money and they'll kill the brand off, saying that they didn't understand what happened while knowing damn full and well someone had pointed the problem out to them. 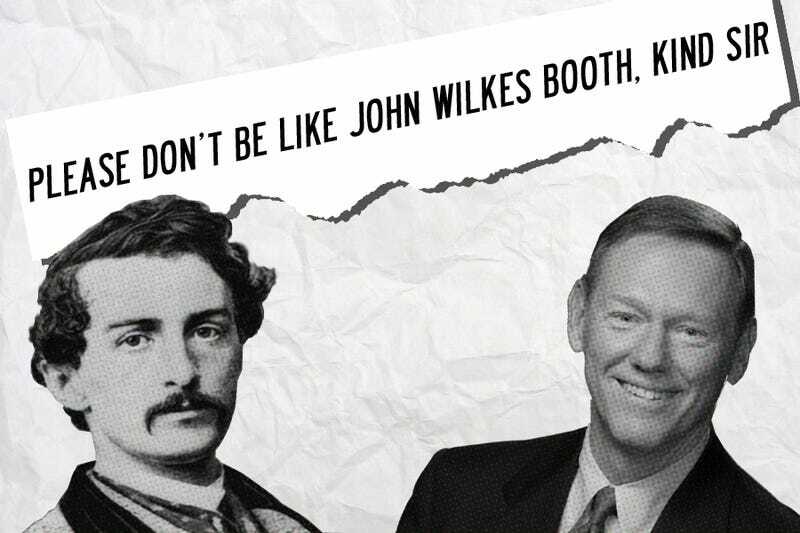 John Wilkes Booth could've only wished to have gotten away with his assassination of President Lincoln as cleanly as Alan Mulally will in assassinating the Lincoln brand should he choose to continue to force it to adhere to the "One Ford" idea, effectively killing it off. Sure, the "One Ford" plan has helped to save the automaker and the Ford brand. I totally understand where it stems from too. But if Ford is serious about reviving Lincoln, it's going to have to leave "One Ford" at the door. If Lincoln is supposed to be a success in ten years, I'm going to have to apologize here. At this rate, I can't see Lincoln finding any success within the next fifteen or twenty. What a shame. Lincoln has built some truly wonderful cars in its 97 year history and there's no excuse for the brand not having another '61 Continental around. In fact, that's the car Lincoln needs right now. It needs to build a new world-class anti-Cadillac. They might even be able to accomplish that with a "One Ford" type of plan if they regroup, study and can actually manage to understand the relationship between VW and Audi. If Mr. Mulally can't be bothered to commit to what really needs to be done at Lincoln it will be his biggest failing during his tenure as CEO of Ford. I also shouldn't have to remind anyone out there the Chinese will snap Lincoln up the first chance they get. And what an even bigger shame that would be: the name and legacy of one our greatest Presidents slapped on the name of a car built in Beijing.